Sweet and Sarcastic: Why Was I Never In A Beauty Pageant? Here are our answers. I hope you find them as amusing as I did. I am really glad that you are also talking to Eva Richardson, because I have a feeling that you are going to get two wildly different perspectives. Do you believe that beauty pageants and contests for little girls are demeaning? I don’t think beauty pageants or contests are demeaning for little girls in and of itself. I think little girls like to dress up, whether it’s for a contest or just to play with friends. In a perfect world, beauty pageants would simply be an opportunity to get dressed up, show off your special talent and have fun. In fact, if conducted in the right spirit, a beauty pageant could even be a confidence booster for little girls -to have a moment on stage to shine while they are singing or dancing or whatever it is that they are especially good at. Do you think beauty pageants and contests are bad for young girls who compete? Given the way you are phrasing these questions, I would imagine you do think that they are very bad indeed for young girls. I believe that the pressure that parents put on young girls during these contests can be very unhealthy. The emphasis on beauty, and only beauty, to validate who you are isn’t something that I believe is good. But, as I said, I do think that there are some excellent potential in beauty pageants. For one, the preparation for such contests often gives a young girl an excuse to work and spend time with her parents. If we strip away the pre-conceived concept of the overbearing mother who is having her 5 year old diet so that she can look good in a swim suit – I think you’ll also find there are parents who are having a good time picking out dresses, practicing a dance routine, or teaching their child how to play the violin. Those are all quality moments spent with your child. I suppose it depends on how competitive the parent is. If a child can learn what it’s like to compete and aren’t chastised for not getting first prize – there is the possibility that they can also learn how to enter into competition for the fun of the competition just like if you were to enter a race or an ice skating competition. In your opinion do you think it is wrong for girls to wear make-up that makes them look like they are adults? Maybe it’s because my mother gave me lipstick to wear at a very young age, but no. I don’t think that wearing make-up is intrinsically wrong. I believe teaching your child that they have to wear make up to look pretty is a terrible message. I could argue that we put stage make up on small children during plays and recitals – be it to look like a lion or simply because in order to see your facial features you need to add make up on stage. Putting on make up to look like an adult during a beauty pageant is just another way to dress the part on stage. Do you believe that when the girls who compete grow up, they will care more about their looks than anything else? Again, I think it depends on how the parents treat the competition. In some cases, in which parents have taught their child that only beauty matters, or beauty is the only thing they have to offer this world, then yes. They probably will have their self-esteem wrapped up in their physical beauty. I think other children will go on to the other things, will grow out of wanting to dress up, might even focus on the talents that they started while competing. I also think with or without the competitions, emphasis on the superficial happens. I also think the opposite effect might occur – a rebellion or realization that beauty isn’t the most important thing – due primarily to entering these contests. What do you think of the girls when they dress up and end up looking like adults? I think my opinion on this is the same as the make-up question. Plus, little girls love to imitate their adult counter parts. They don’t need a pageant to do this. 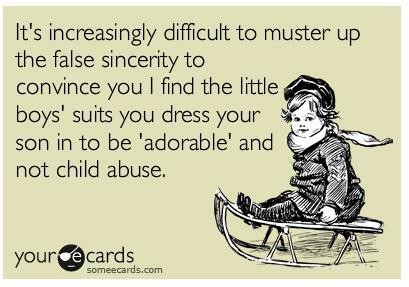 This particular question doesn’t actually apply to pageants though, and I could bring up the fact that I just bought skinny jeans, a leather jacket and Van’s for a new born – and he’s going to look adorable in them. We buy mini versions of adult clothing all the time for little kids. We have Mother-Daughter outfits that we ooh and aah over – and honestly, I have no problem with any of it. Sorry, if this wasn’t what you were looking for. Given your leading questions, you clearly wanted me to argue the other way – but as I said, that’s why I’m glad you asked Eva also. Have a great week – and let me know if you have any additional questions. 1. Do you believe that beauty pageants and contests for little girls are demeaning? I believe that beauty pageants send the wrong message to little girls. They convey the message that their looks are of the utmost importance and that the girl with the best “look” will win the pageant and praise from others. This is a dangerous message to impart to children, particularly girls. 2. 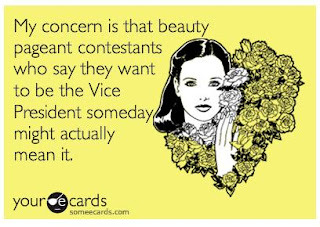 Do you think beauty pageants and contests are bad for young girls who compete? I think that beauty pageants have negative effects on young girls. Young girls should be exploring their environment and playing with other children. They should not have to worry about presenting themselves to adults in the best light and their looks and presentation should be the last thing on their minds. Beauty pageants rob children of the essence of childhood. 3. In your opinion do you think it is wrong for girls to wear make-up that makes them look like they are adults? Absolutely! Make-up is used to enhance those features that the opposite mate finds attractive. This should be a non-issue for girls! Wearing make-up sexualizes them and may impart the message that, again, they need to focus on and enhance their physical appearance. 4. Do you believe that when the girls who compete grow up, they will care more about their looks than anything else? They will either grow up and worry about their looks or rebel and care less about them. Beauty pageants are not normal to child development. 5. What do you think of the girls when they dress up and end up looking like adults? It’s creepy. It sexualizes them and sends the wrong message to them and to other adults. It is confusing to look at a child and to see the makings of a child but the couture of an adult.